Kiefer Sutherland Network Your best site dedicated to the Canadian actor Kiefer Sutherland! 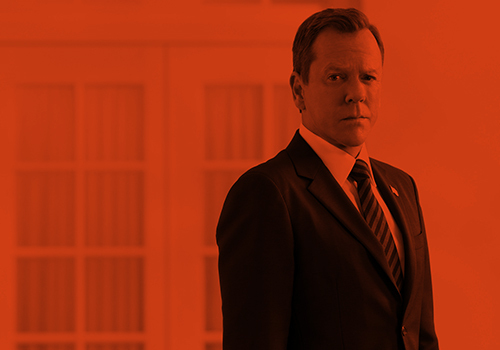 Welcome to Kiefer Sutherland Network, your best source dedicated to the Canadian actor Kiefer Sutherland! Most known for his role as Jack Bauer on the FOX hit 24. Kiefer has also been in shows like Touch and Fallen Angels. He's also been starred in many movies such as The Sentinel, Flat Liners, Young Guns, Taking Lives and Mirrors. Here you will find high quality screen captures, promotional images, event photos and much more in our gallery, currently housing over 50,000 photos! Check back often for the latest updates! Donald Sutherland shares the screen with his son Kiefer for the first time in the upcoming western, Forsaken, and ET has a behind-the-scenes first look. The drama takes place in 1872 when gunfighter John Henry Clayton (Kiefer) retires and returns to his hometown of Fowler, Wyoming, hoping to repair his relationship with his estranged father, Reverend Clayton (Donald). Their bond is once again put in jeopardy when a gang begins terrorizing the local ranchers who refuse to sell their land to the railroad company that wants to build there. John Henry knows he’s the only one capable of fighting off the gang, but his father forbids him from returning to a life of violence. Despite being an Emmy and Golden Globe winner, Kiefer admitted to having concerns about playing opposite his legendary father. The energy from the family reunion wasn’t lost on the rest of the cast. Co-star Demi Moore, who previously worked with Kiefer in A Few Good Men and Donald in Disclosure, was drawn to the concept of the men playing father and son onscreen. “I was aware that they had never worked together before, so as I read the story between a father and son, I felt quite captivated by the personal and professional opportunity that it brought,” Demi said. Check out Forsaken in theaters and on VOD Feb. 19. This entry was posted by Courtney on Friday, January 15th, 2016 at 1:32 pm. It is filed under Articles, Forsaken, Videos. You can follow any responses to this entry through the Comments Feed. A low-level Cabinet member becomes President of the United States after a catastrophic attack kills everyone above him in the line of succession. While we are lucky enough to have a free host for our site, there are still costs to run a good fansite. Any donations sent through this form will go to domain renewals, obtaining high quality photos for the gallery and/or purchasing items for the site. If you are so generous, we thank you in advance for your donation! Kiefer Sutherland Network is an unofficial fan site and has no affiliation with Kiefer Sutherland, his management, or anyone else affiliated with him in anyway. All trademarks and copyrighted materials on this site are the property of their respective owners. The intent of this site is not to infringe on any copyrights, but rather to serve as a resource for fans of Kiefer Sutherland. Please contact us if you have any questions or concerns.